A musical composition inspired by the horsemeat scandal is to be premiered at a concert in Glasgow on Saturday. The Unspeakable will be performed by musicians from the National Youth Orchestra of Scotland (NYOS) Camerata at Hutcheson's Primary in Govanhill. The piece was composed by Eve Harrison, after workshops with children from Raploch's Big Noise orchestra. 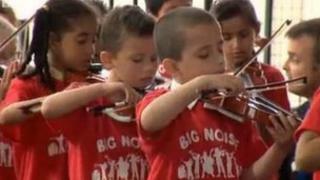 Big Noise uses music-making to help children in less affluent areas build confidence, pride and aspirations. The first Big Noise centre was set up by the charity Sistema Scotland in Raploch in Stirling in 2008. The second orchestra was launched earlier this year in Glasgow's Govanhill area. Eve Harrison said: "I hope I have captured the pride, zeal and imagination of the Raploch young people. They were so buzzing with ideas. "The piece evokes a visit to the Wallace Monument and the Carnival as well as horsemeat, which was big in the news when we had our first workshops." NYOS Camerata has members aged between 18 and 23 and is the pre-professional chamber ensemble of The National Youth Orchestras of Scotland. It bridges the gap between the youth orchestra and professional ensemble. Members have spent time shadowing Big Noise tutors in Raploch and have delivered workshops to schools in Govanhill. As part of the collaboration, NYOS and Sistema Scotland jointly commissioned Eve Harrison to create a new piece based on the Raploch workshops.